Purely coincidentally, I’ve been reading N. M. Kelby’s White Truffles in Winter about the last days of the celebrated chef Escoffier alongside Jonathan Grimwood’s The Last Banquet, set in pre-Revolutionary France. Both are about Frenchmen with a passion for food who love and admire women, both have recipes scattered through them and both men are looking back over eventful lives at a crucial point in history. Kelby’s novel is an affectionate portrayal of a man dedicated to the pursuit of perfection but who knows how to make chicken taste like sole when the fishmonger fails to turn up. At the end of his life, his wife desperate to have a dish named after her before she dies, Escoffier is still obsessed with Sarah Bernhardt with whom he has enjoyed a long intimacy, willing to teach the sassy Sabine how to cook for the resemblance she bares to Bernhardt alone. Not yet finished it but I’m enjoying it very much. Escoffier and Jonathan Grimwood’s Jean-Marie d’Aumout would have had much to talk about. We first meet the five-year-old Jean-Marie in 1723: he is enthusiastically eating stag beetles, analysing their taste and describing it to himself. Orphaned, he is rescued by the Duc d’Orléans who introduces him to the delights of Roquefort and sets him on a path which takes him to the military academy where he meets friends who will remain influential in his life, and in the world, then marries twice for love – once to a noblewoman he rescues from a wolf, once to a peasant – becomes Manager of the Menagerie for Louis XV, negotiates with Pasquale Pauli on the eve of the Corsican war for independence and is take prisoner, then retires to his chateau where he treats his workers well and pursues his scientific and culinary curiosty, always attended by Tigris, the blind tiger he has reared from a cub. For Jean-Marie, the whole world’s a pantry and continues to be so throughout his long life during which he consumes an astonishing variety of things, from flamingo’s tongues to well, you’ll have to read it to find out what the last banquet is. He is the embodiment of Enlightenment values – he corresponds with Voltaire and writes the Corsican entry for Diderot’s encyclopedia, he is a deist fascinated by science and his enlightened ideas extend to the way he runs his estate. Having followed the trajectory of the Age of Reason the novel ends in 1790, the year after the Revolution began. 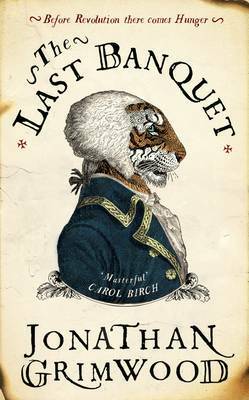 Vibrantly original, filled with vividly descriptive passages and with a brilliantly playful cover, The Last Banquet rivals The President’s Hat as my best read of 2013 so far. Given that the excellent Canongate are Jonathan Grimwood’s publishers it seems appropriate to wish them a happy fortieth birthday. Lots of celebrations planned throughout the rest of the year, apparently, and they’re on the look out for the next generation of storytellers working across all media, from books to film and games – find out more here. You have to be Scottish, though. 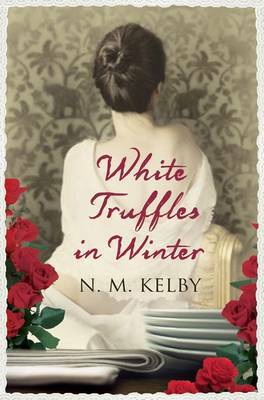 This entry was posted in News, Reviews and tagged Alma Books, Canongate, Jonathan Grimwood, N M Kelby, The Last Banquet, White Truffles in Winter on 22 July 2013 by Susan Osborne. I stumbled across your blog last week and have been enjoying your reviews. I also liked White Truffles in Winter, and hope to read The Last Banquet soon. Other similar reads you might want to seek out (also about young chefs with a passion for food) are John Saturnall’s Feast by Lawrence Norfolk and Appetite by Philip Kazan [which I reviewed here if you’re interested: http://www.welovethisbook.com/reviews/appetite%5D. Very pleased to hear that you’ve enjoyed the reviews, Rebecca. Funnily enough I was thinking as I read both books that there seemed to be a bit of a trend for foodie novels. I’ll add Appetite to my ever lengthening list – gorgeous cover.